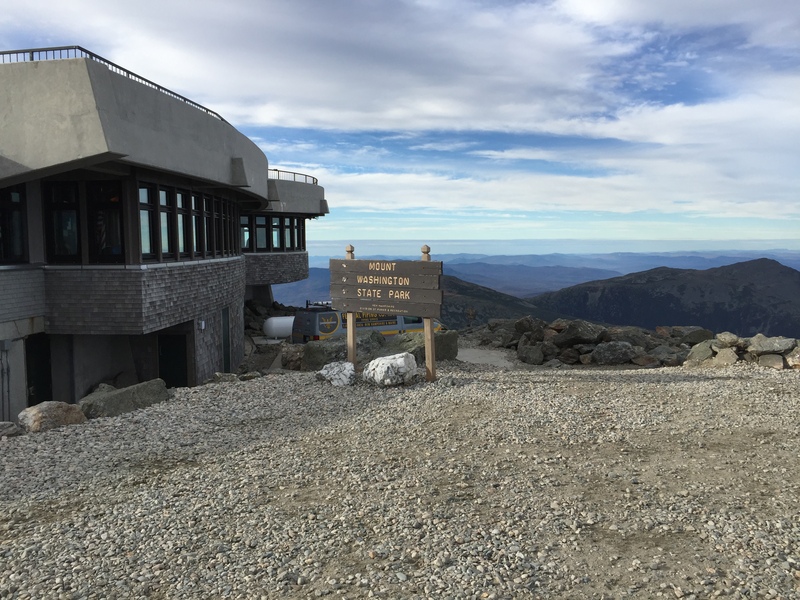 Three years ago we explored the White Mountains of New Hampshire and took a shuttle van ride up to the top of Mount Washington, the highest summit in northeastern USA at 6,288 feet above sea level. That was a great trip. 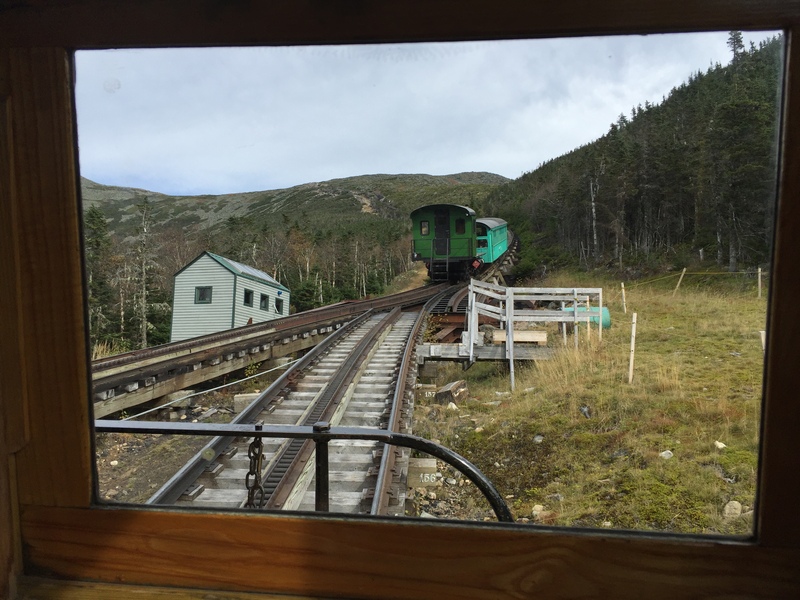 This time we wanted to return just to take the Cog Railway to the top. 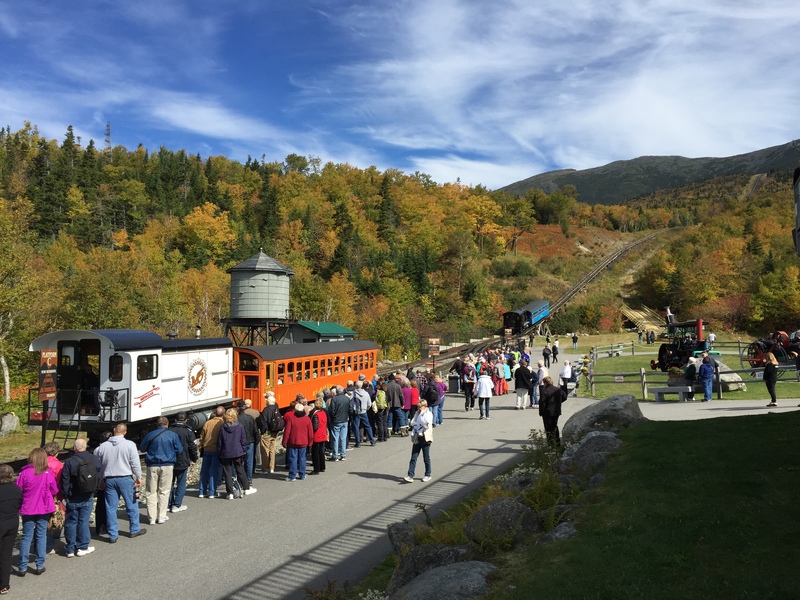 The Mount Washington Cog Railway is the first mountain climbing cog railway in the world and is a National Historic Engineering Landmark. The first locomotives, beginning in 1869, were steam powered. In 2008 they began switching to bio diesel. There is still one steam powered locomotive run every morning. 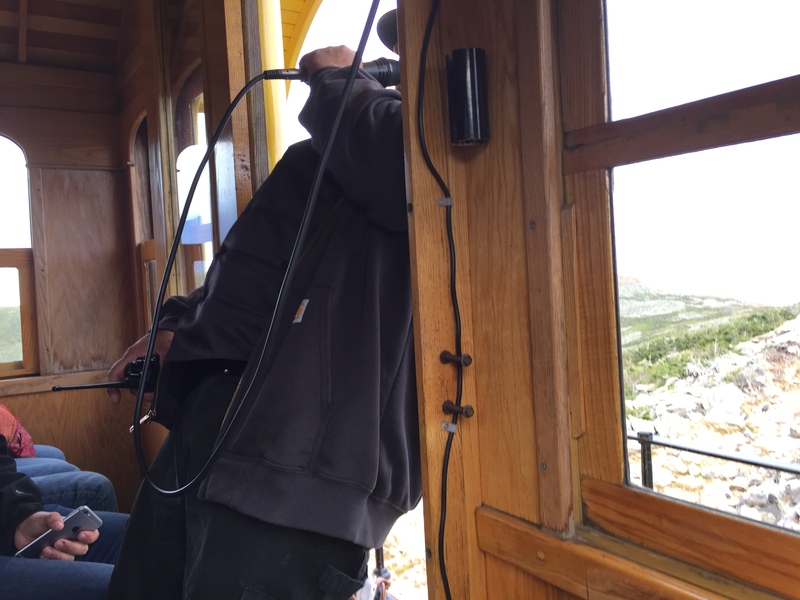 The train goes about 4 miles per hour and takes about an hour to get to the summit. 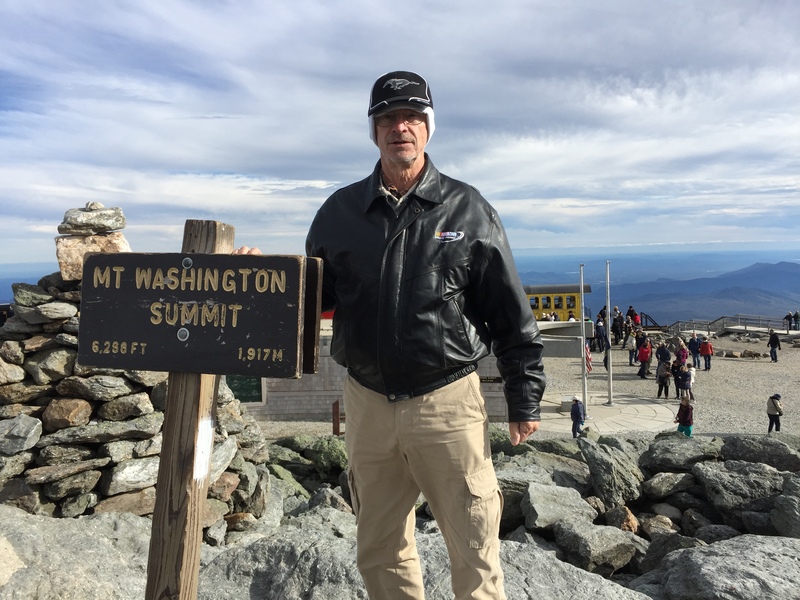 It’s a three hour tour…one hour up, an hour exploring at the top, and an hour down. We were lucky enough to score the front window seat! lucky us! This gave us some great photo ops. Half way up we have to stop and wait for one of the returning trains before taking our turn to the top. Our breakman pointed out things to see along the way. You don’t really notice the incline much until at one point the breakman stood up without holding on to anything, then you could really see it. He encouraged everyone to stand and try it too. The Appalachian Trail crosses underneath the tracks near the summit. 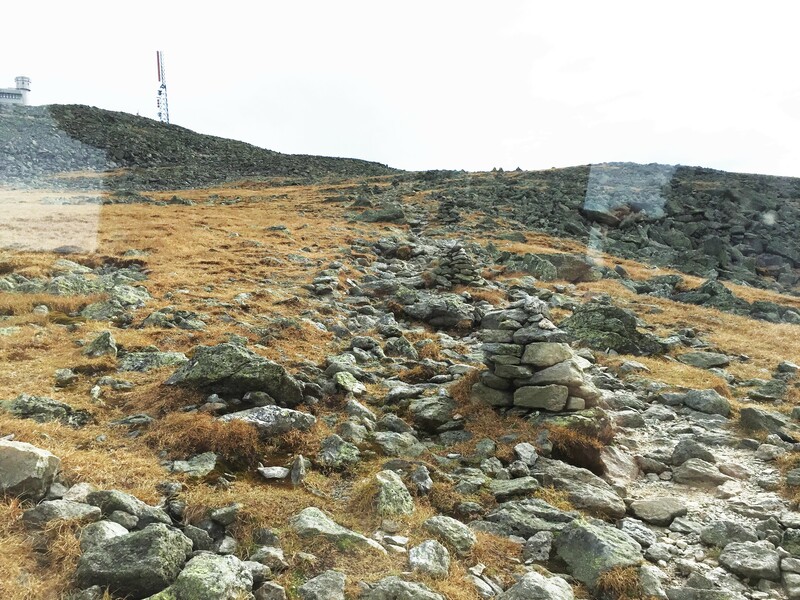 We are above the tree line now and the trail is marked with pyramid piles of rocks known as cairns. At the top is the Tip Top House, an 1853 hikers hostel. 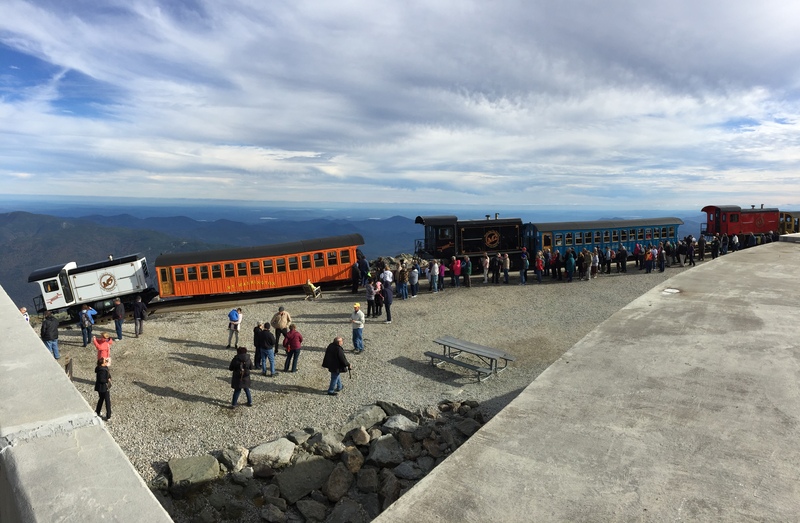 There is also a huge observation deck on top of the visitor center/cafe/museum building. And there are a few other weather observation buildings and towers. We were lucky enough to be here on one of the nicest best weather days. 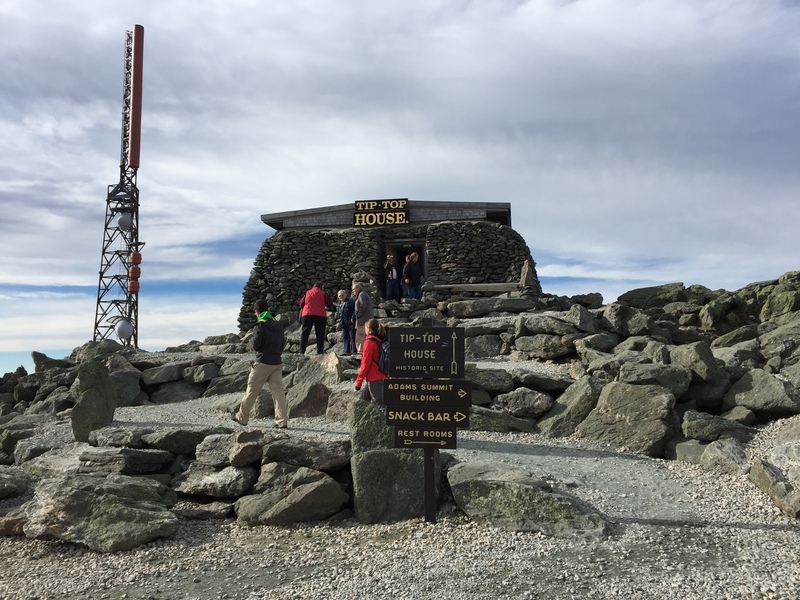 They said that on a clear day we can see four states, the province of Quebec in Canada, and the Atlantic Ocean. 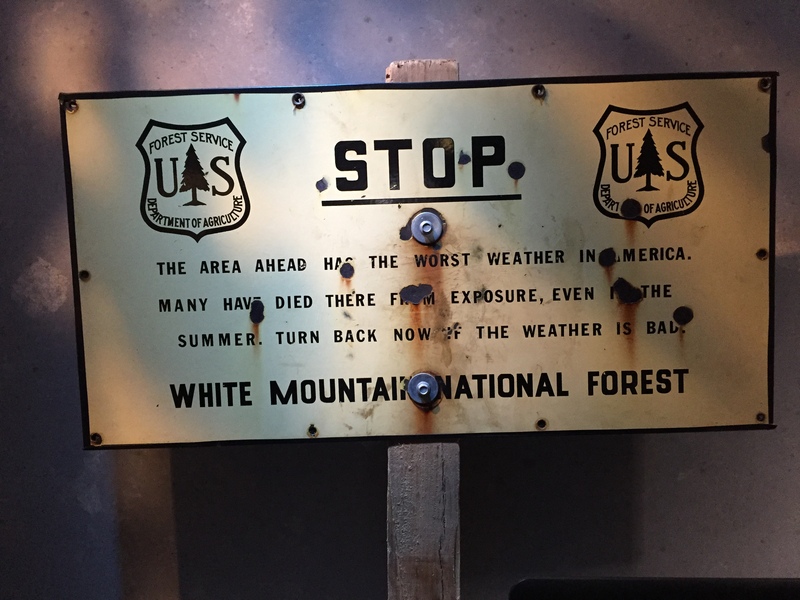 The museum had lots of information about the history of the place, including this old sign. 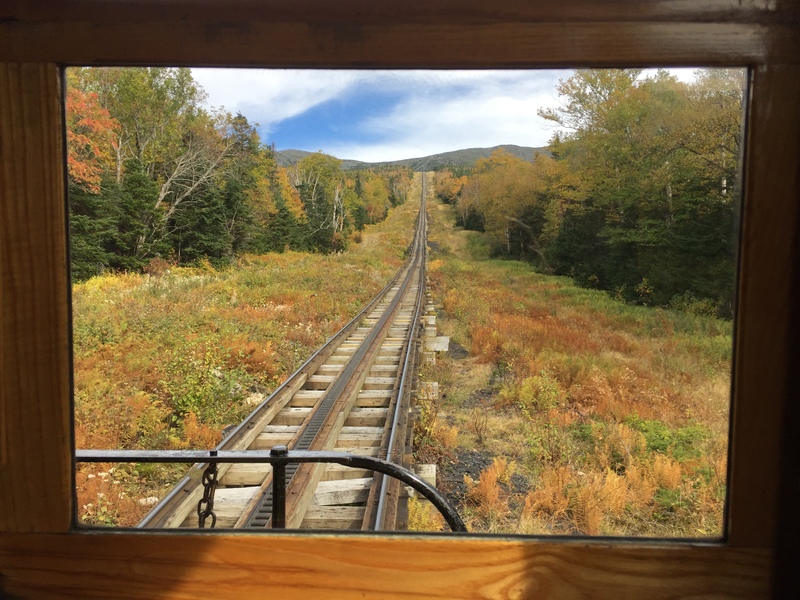 Besides the Cog Railroad, or the shuttle van, you may drive yourself up the Mt.Washington Auto Road if you have the courage. It is an eight-mile narrow two-lane road with no shoulder and no guard rail. Maybe next time. 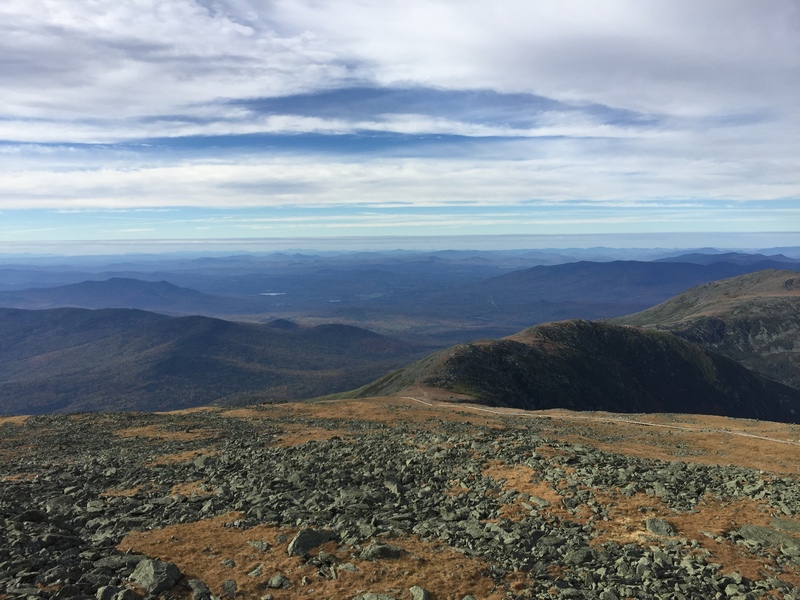 This entry was posted in Daily Post, New Hampshire, October and tagged Appalachian Trail, Cog Railway, Hiking, Mt. Washington, Train. Bookmark the permalink. Great pictures – looks like it was cold???? 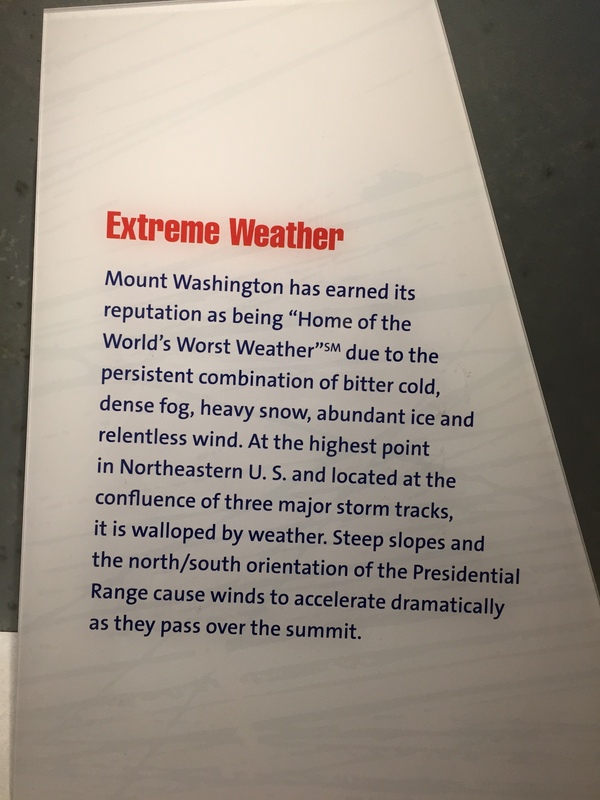 It was about 34 degrees, about 20 degrees colder than it was down below. We were lucky to have such a mild day.